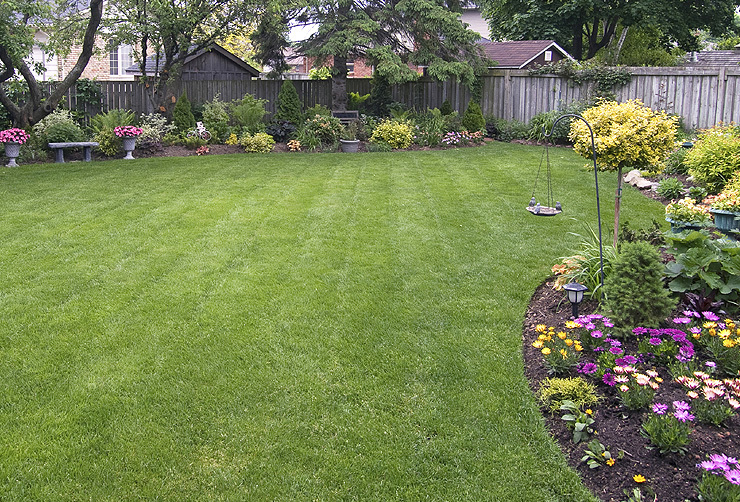 Your lawn is the first impression of your home. So when your green carpet doesn’t look so green, the cause could be many: drainage, insects, disease, shade, drought, tree roots … and the list goes on. The key to renovating your lawn is to first understand the issue at hand. Let our State of Kansas-certified Lawn Technicians conduct a thorough Lawn Analysis, at no cost. Like a health examination, the Analysis will give you a snapshot of how your lawn’s doing, and what you can consider doing to improve its health, and your neighbor’s head turns. Your lawn’s best kept secret? It needs oxygen as much as precipitation. So while it’s easy to provide water, it’s not so easy to provide air. That’s when core aeration comes in. Our Lawn Technicians will examine your lawn’s soil structure and composition to determine how core aeration can enhance nutrient absorption and promote soil penetration of air, water, and any fertilization program your lawn may be receiving. You can run grooves in your yard and scatter seed, or you can develop a plan. At Suburban, we prefer the latter - and that’s why we think you’ll prefer Suburban. Our certified Lawn Technicians know how to see things in a lawn you’d never think possible, including stuff like soil compaction levels and thatch-to-soil ratio. So when it’s time to verticut and seed your lawn, we’ll have every detail down, from vertical depth to seed type to custom maintenance plan. Bermuda grass is fast, tough, and stubborn. Tough to kill, it requires a relentless program starting with two to three treatments of a special herbicide when the grass is healthy and full, to maximize the herbicide’s absorption. Once dead, the lawn is thatched to remove as much Bermuda (dead or alive) as possible. The new bed is then prepared. Finally, it’s time to seed or sod, followed by a custom maintenance program – again utilizing your no-cost Lawn Analysis. Truly a biological wonderland, your lawn is brimming with activity. Just below your feet is a living, breathing and growing world, complete with oxygen, food, vitamins and minerals, and lots and lots of healthy grass. Let’s keep everybody healthy. Including your lawn.